As a pregnant woman I have a lot on my mind. How is the little guy doing in there? Am I eating enough vegetables? Will the baby's room be ready before his arrival? Do I have all the baby gear that I need? What should I pack in my hospital bag? Am I getting enough nutrients for me and baby? Thanks to my friends and family, I have almost all the baby gear that I will need when the little man arrives. 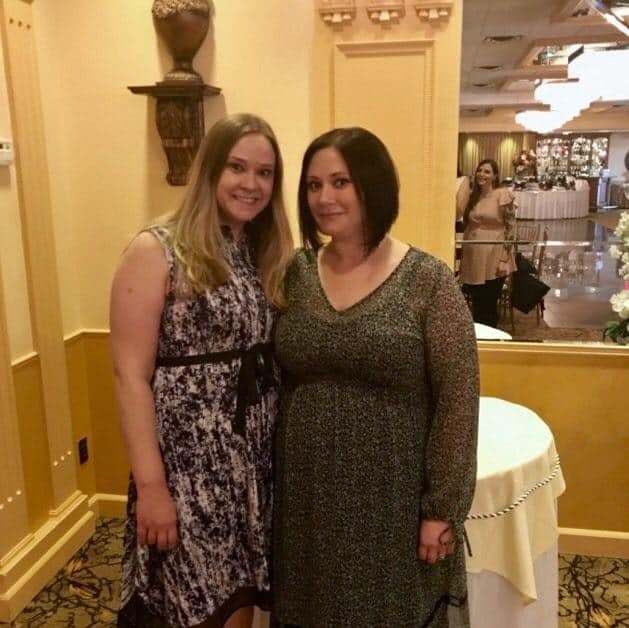 This past weekend I celebrated my little man's upcoming arrival with my friends and family at a beautiful baby shower. My mother, sister, and BFF did a terrific job planning everything, from the venue to the games. 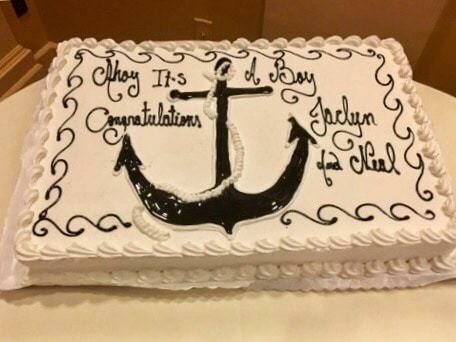 My baby shower's theme was “Ahoy, it's a boy!” which is perfect since we are in the process of designing our little man a nautical nursery. I am so very grateful for all the friends and family that came out to celebrate with us and, of course, for their generous gifts! 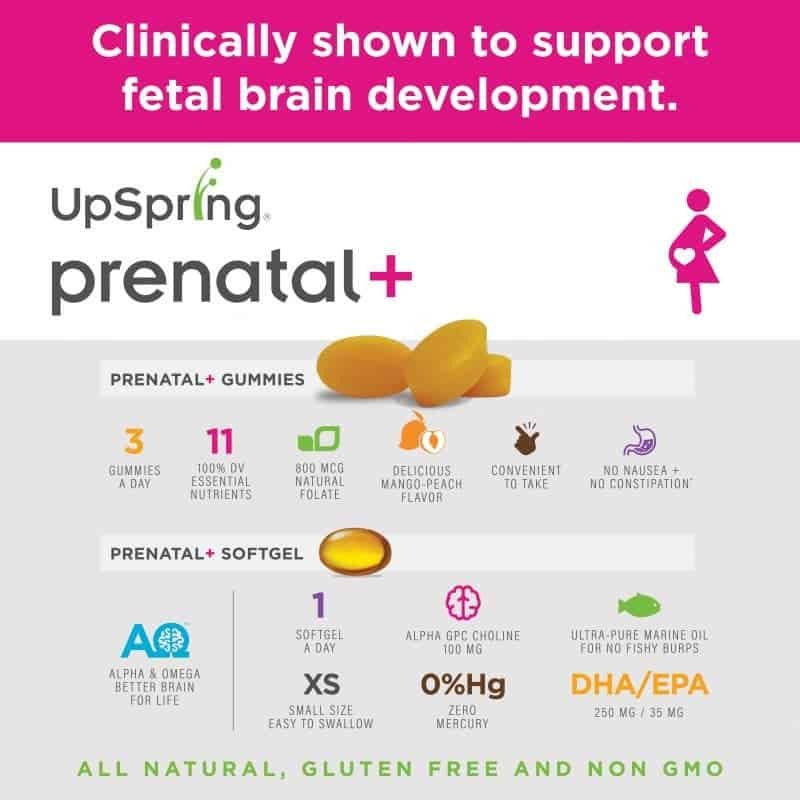 Thanks to UpSpring Prenatal+ Gummy I can rest assured that I am getting 100% of the daily value of 11 essential nutrients, plus brain-building omega-3 DHA and choline (in the form of Alpha GPC) in a great tasting, all natural gummy and liquid softgel. Getting enough choline during pregnancy is vital, as it is required for healthy fetal brain development. Alpha GPC is the only form of choline that crosses the blood-brain barrier to nourish baby’s rapidly growing brain. It also works to amplify the amount of DHA absorbed by the body. This formula also contains the natural form of vitamin B9, folate, instead of synthetic folic acid. Expecting mother's don't need a prenatal vitamin that is tough on the stomach and creates nausea. We have a difficult enough time with morning sickness (which, by the way, occurs all day long… not only in the morning), amirite?! 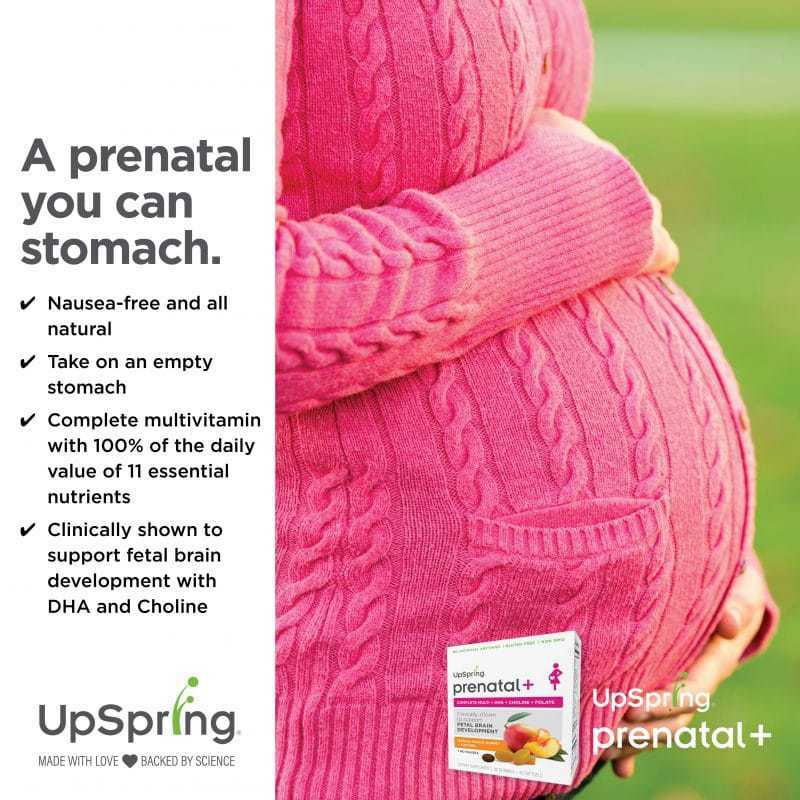 UpSpring Prenatal+ Gummy is easy on sensitive stomachs and has no fishy aftertaste whatsoever. No nasty fish burps here! 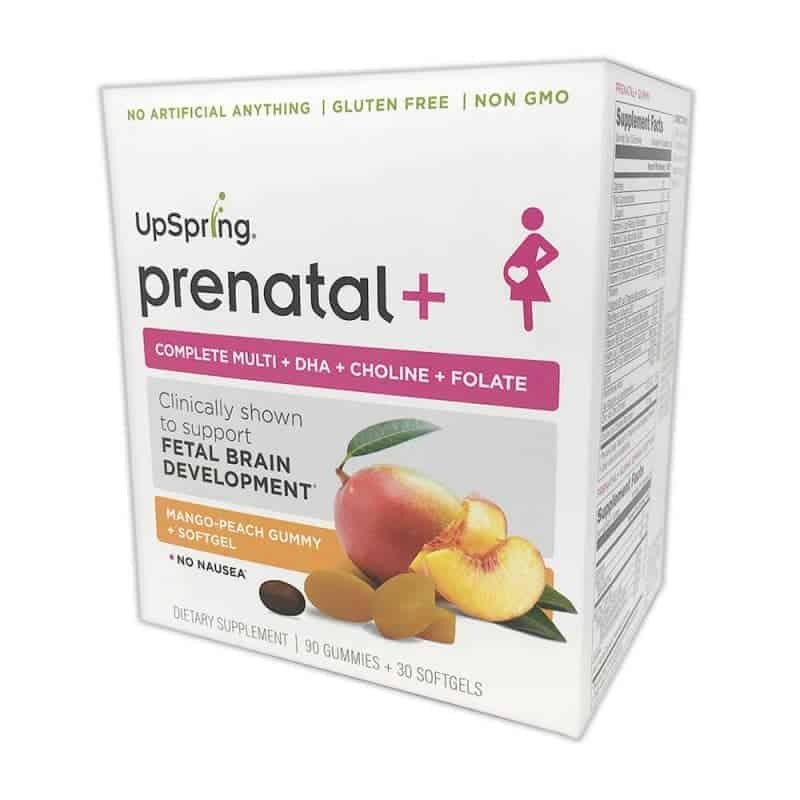 UpSpring Prenatal+ mango-peach flavored gummies are so tasty that I actual look forward to taking my prenatal vitamin each day. The softgels have are small and go down easily with a gulp of water. It was important for me to find a prenatal vitamin that was not only easy on the tummy, but also all natural. UpSpring Prenatal+ Gummy is all natural, low sugar, gluten free and non-GMO. I am happy that I have found UpSpring Prenatal+ Gummy and now rely on them as a daily part of my pregnancy routine. You can find UpSpring Prenatal+ Gummy at Target in the Women's Health & Family Planning aisle, where it retails for $24.99. For more information visit the UpSpring website. What a tasty way to get vitamins to mom’s and their babies! And I bet it tastes like a treat/snack especially if you savor it! When I had my babies, the prenatal vitamins were HUGE! I had a hard time swallowing. Especially in my ninth month when it felt like my babies were in my throat already. I’m pretty sure that they weren’t all natural either. I had to eat food when I took these vitamins also. I wonder if insurances cover the cost of these? Mine were covered back then. Thanks for sharing this important information! These look like great vitamins! I am amazed at all of the advances made in such a short amount of time. I didn’t know choline was important in a prenatal! I will recommend these to all of the pregnant women I know. I loved having gummy prenatal vitamins when I was pregnant! It just made them easier to take, because it was like eating candy lol! I could have used this when I was pregnant with my kids. My vitamins made me SO nauseous! I still take gummy multivitamins because they are much easier on my stomach.